One of the features on the lock screen in Windows 8 and Windows 10 is a list of all the user accounts on the computer. But what if you created an account for running a service or have a secret administrator account you don’t want to expose to everyone on the lock screen? With the help of a simple registry tweak, you can hide specific users from appearing on the lock screen. 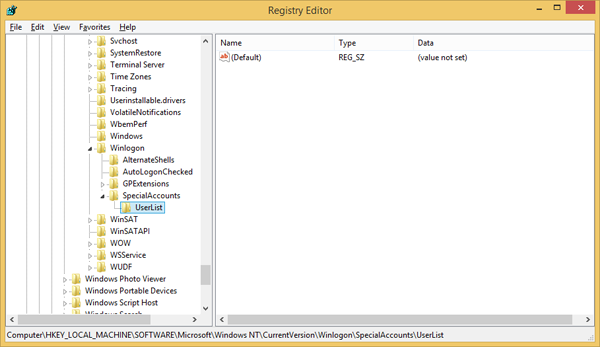 First, open up Registry Editor by clicking on the Start Button, typing regedit and hit Enter. Navigate through HKEY_LOCAL_MACHINES, SOFTWARE, Microsoft, Windows NT, Current Version and finally Winlogon. Next, you will need to create some new key. Right click on the Winlogon key and select new and then key. Name the key SpecialAccounts and hit enter. 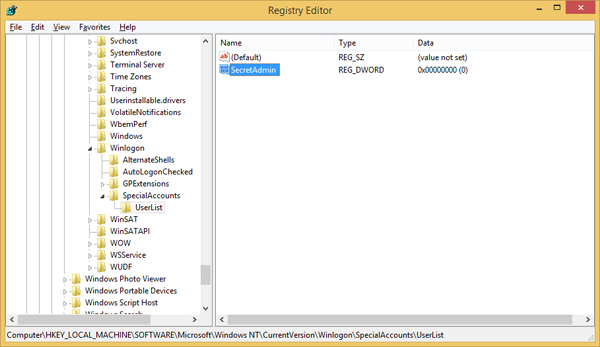 Right click on the new SpecialAccounts folder you just created and select new and then key. Name the new key UserList and hit enter. Now you will need to specify the account names you want to hide. Right click on UserList and select new and then DWORD (32-bit) value. Name the new DWORD as the account username you want to hide. After you log off, the user account will no longer be displayed. The process can be reversed by simply deleting the account name DWORD you created.